Leanne Baghouti, a British-Palestinian won her local round of Speaker's Trust "Speak Out" competition with an impassioned talk about Palestinian human rights. Her talk, and all sign that she had won the competition, were later deleted from the competition web site. A colleague characterised her talk as "full of anti-Semitic and aggressive material from sources in the Middle East". I watched the video, and heard nothing anti-Semitic. It is a word that should be used with care. Our primary duty of care is to the young people we work with and we cannot tolerate any form of insult or abuse. We are concerned and saddened that Leanne’s experience has been less than positive. Leanne Mohamad is the Redbridge Regional Final winner and there has never been any suggestion that she should be disqualified. Almost 190,000 young people have spoken out over the years on any topic which they feel passionately about and none has ever been banned from the process or silenced. We are, however, a small charity without the capacity to moderate comments 24 hours a day and it was considered essential to protect Leanne by temporarily suspending the regional video over the bank holiday, until we were able to consult with her school and family. Of 37 talented regional Champions only fifteen can be voted through to the Grand Final. This selection process took place on Saturday 21st May based on standard judging criteria and without any external influence or input. The general “rules” of effective public speaking are guidelines to help speakers to create a speech that will connect with a large and diverse audience and every speech was judged on its own merits. 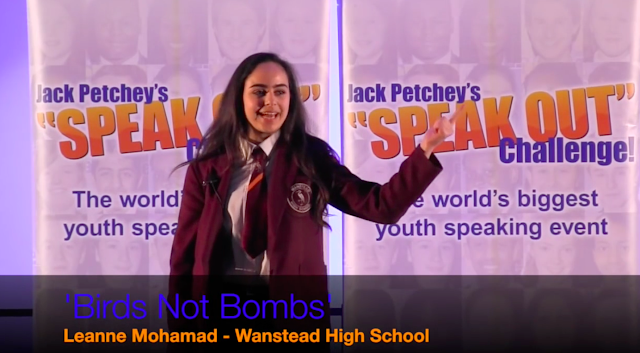 At the heart of what we do lies the determination that all of our young speakers, irrespective of background, race or creed, should be able to speak out in a safe and supportive environment. Omar Barghouti, a Palestinian living in Israel, has been denied the right to travel, for no reason other than that he is an effective supporter of BDS (Boycott, Divestment, Sanctions). Glenn Greenwald interviews him in The Intercept. 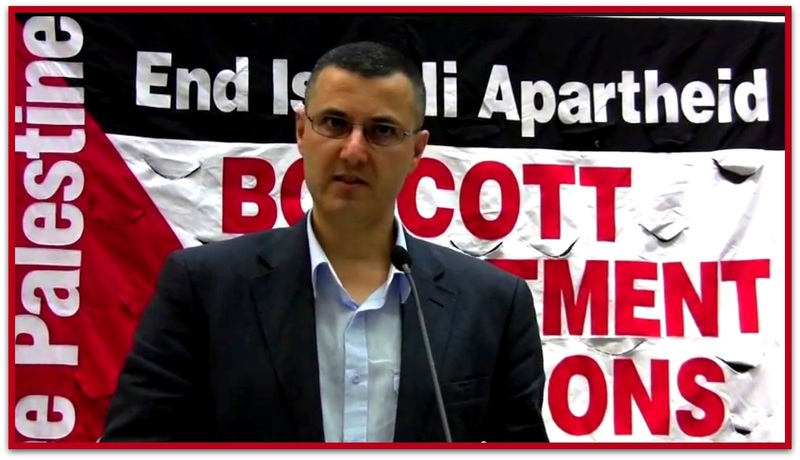 We live in a country where racism and racial incitement against indigenous Palestinians has grown tremendously into the Israeli mainstream. It has really become mainstream today to be very openly racist against Palestinians. Many settlers and hard-right-wing Israelis are taking matters into their own hands – completely supported by the state – and attacking Palestinians. 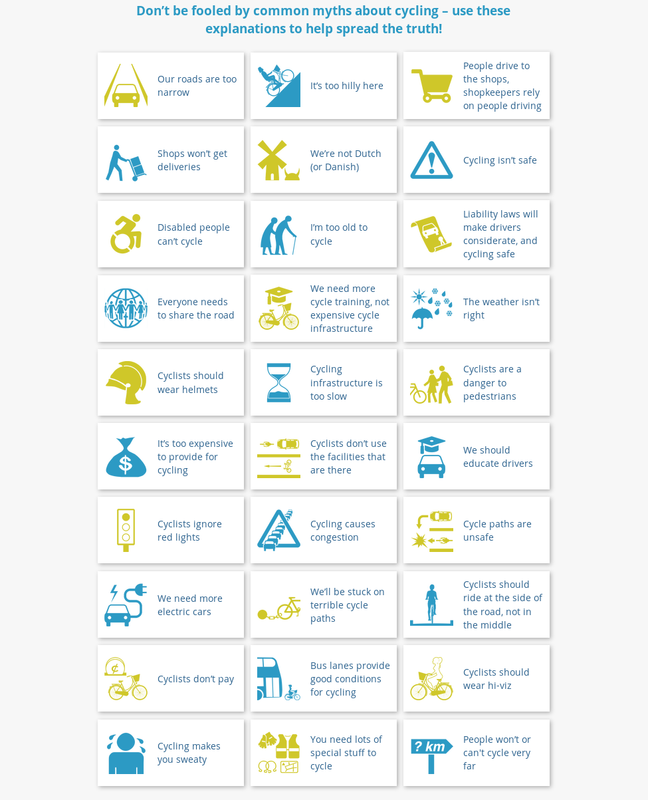 Cycling Fallacies is a handy reference from The Cycling Embassy of Great Britain. A sample entry is copied below. Spotted by Ewen Maclean. Cycling infrastructure (or pedestrianisation) does not restrict access to shops – it can actually make the streets and roads shops are on nicer places to visit, increasing footfall, and overall demand. Many studies – from the Netherlands in the 1970s, to big US cities in the 2010s – have found that installing cycle infrastructure does not have a negative effect on income of businesses, and in most cases has a positive effect. It's a popular myth that people who arrive by car spend more. 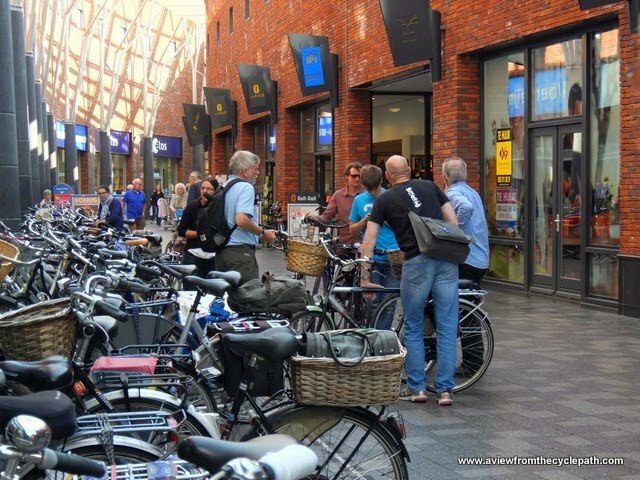 People who arrive at shops on foot, or by bike, may spend less per visit, but they will visit more often, and they will spend more money overall. And being able to access a shop easily by foot or by cycle means that more frequent trips involving smaller ‘baskets’ become more convenient. The headline message is: well-designed streets that make cycling and walking attractive are good for business. And in any case, cycling infrastructure won't stop people driving to shops, or parking near them and walking a short distance.